I waited a few years to get a good look at Snow Buntings and was very happy when it finally happened. When your a "birder" and you finally see a bird that you've been wanting to see for a long time, and in this case, years, it's a thrilling experience. 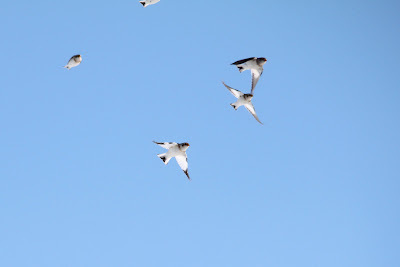 One of these birds for me was the Snow Bunting. 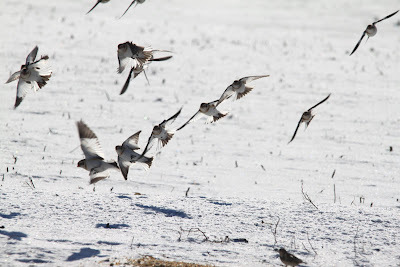 They have eluded me for years, unless I count little black spots that I had seen a couple times far off in a field and was told were Snow Buntings. That didn't count. When we started visiting the Ruthven Banding Station this past spring, and I found out that Rick also banded these little beauties who visit in the winter I got super excited, as I knew my chances of seeing them this winter was almost a for sure thing. These bird can come from as far away as Greenland! 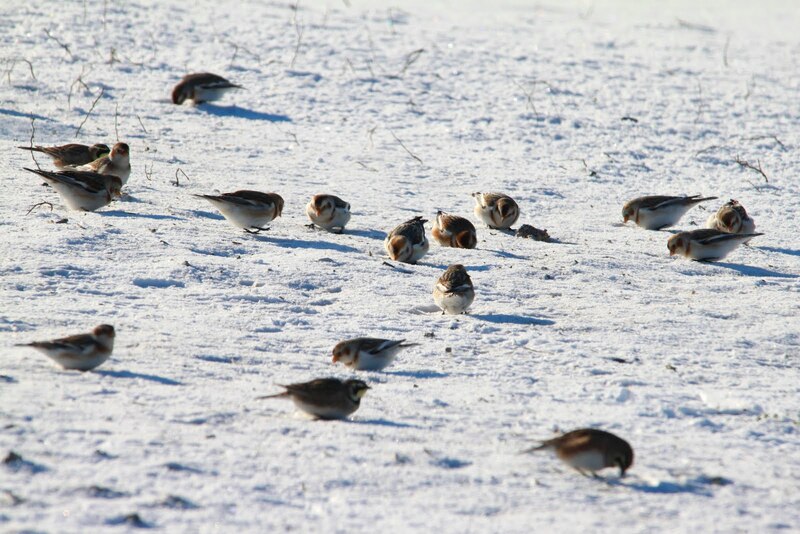 This past Sunday was my Snow Bunting day. Rick let it be known Saturday evening where they were and that he'd be there banding Sunday morning. Rob and I headed over that morning as well and I finally got my first real look at Snow Buntings and even got to hold one! 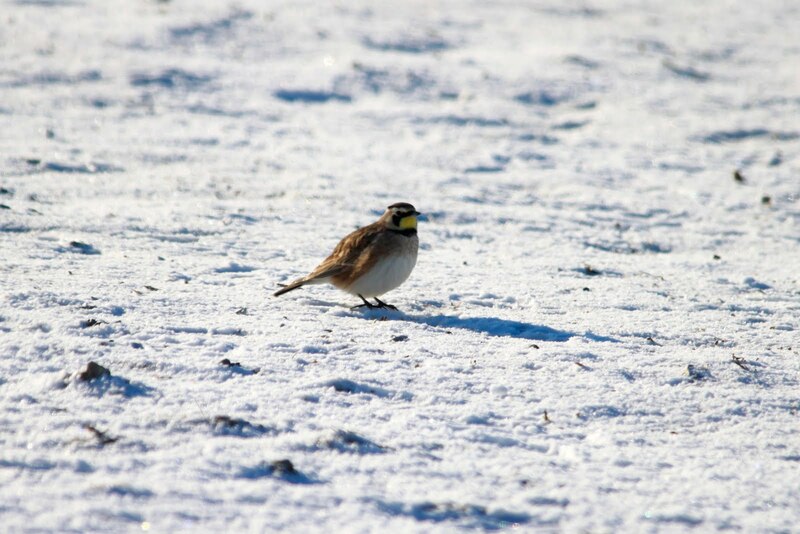 Snow Buntings and Horned Larks. Rick banding a Snow Bunting in the car while I watch from the back seat. Rick handing me a Snow Bunting to release after he banded her. 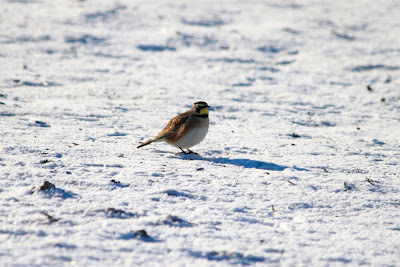 A better look at a Horned Lark. Rick told us the birds were skittish due some predators in the area, and weren't staying on the ground long. After waiting about 30 minutes after the first and only land they made near the ground traps while we were there, Rick decided to pack up, as he'd been there a few hours and had banded some before we arrived. We decided to head over to the Ruthven grounds to see what we could see and enjoy a walk. He told us to come back to the spot after our walk at Ruthven as the Snow Buntings would probably be around enjoying the cracked corn in the areas where the ground traps had been. Enjoying a walk in the snow at Ruthven. Birds seen at Ruthven included; Titmouse, Red-bellied Woodpeckers, White and Red-Breasted Nuthatches, Cardinals, Chickadees, House and Gold Finches, Junkos and Downy Woodpeckers. We returned after a great walk and many sightings at Ruthven and Rick was right! 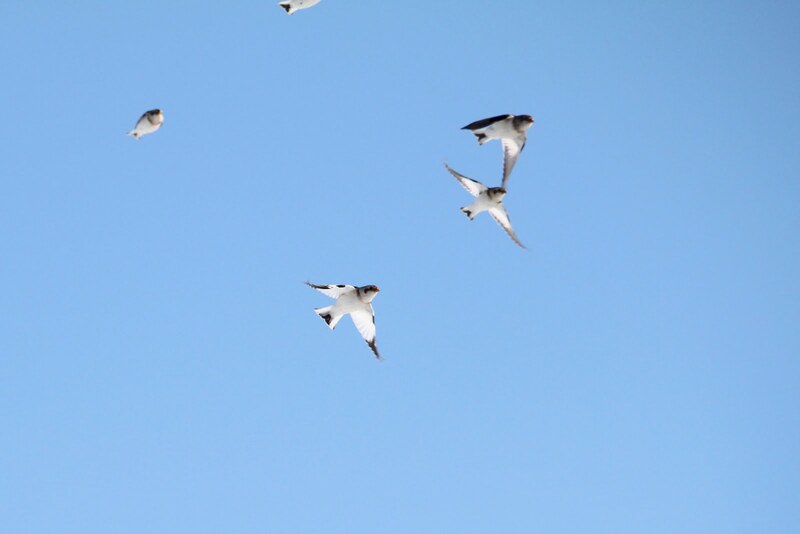 The Snow Buntings were there and what an aerial show these birds put on for us! They fly together as a flock, it's like watching the Snow Birds! They fly around, land, eat for a while, and then do it all over again. They flew right over us at one point which was a joy to experience. Looks like a great day to be outside!